Ian Skelly presents Radio 3's annual journey around Europe for a sequence of live and specially recorded concerts. The day begins live in Helsinki, then to Vienna. Ian Skelly presents Radio 3's annual journey around Europe for a sequence of live and specially recorded concerts. The day begins live at Kallio Church in Helsinki for a programme of music for organ and wind quintet. Then to St Ulrich's Church, Vienna, where the Vienna Chamber Choir perform traditional Christmas songs. 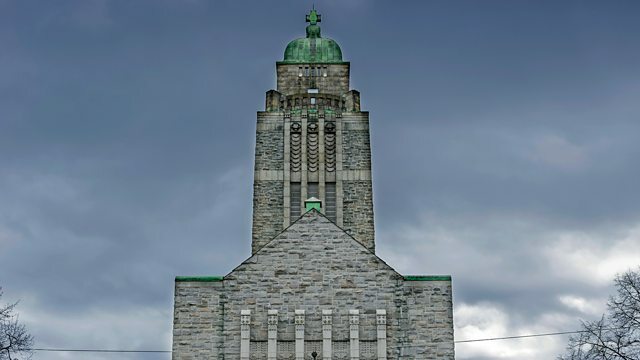 Main image: Kallio Church, Helsinki (c) Getty Images. Music Arranger: Harri Ahmas. Ensemble: Zagros Wind Quintet. Performer: Suvi Väyrynen. Performer: Jan Lehtola. Music Arranger: Harri Ahmas. Performer: Suvi Väyrynen. Ensemble: Zagros Wind Quintet. Choir: Vienna Boys' Choir. Conductor: Peter Marschik. Choir: Vienna Academy Youth Choir. Conductor: Michael Grohotolsky. Choir: Vienna Academy Youth Choir (Jugendchorakademie Wien). Conductor: Michael Grohotolsky. Composer: Elena Hobarth. Choir: Vienna Academy Youth Choir (Jugendchorakademie Wien). Conductor: Michael Grohotolsky. Choir: Wiener Kammerchor. Conductor: Michael Grohotolsky. Music Arranger: Ola Gjeilo. Choir: Wiener Kammerchor. Conductor: Michael Grohotolsky. Music Arranger: Theresa Hemedinger. Choir: Wiener Kammerchor. Conductor: Michael Grohotolsky. Music Arranger: Jan Sandström. Choir: Wiener Kammerchor. Choir: Vienna Academy Youth Choir (Jugendchorakademie Wien). Conductor: Michael Grohotolsky. Be inspired by these wonderfully quirky festive practices, from folklore to TV schedules.